VeriCite DocumentationUser GuidesPolicies and General Info SupportHow do I get support for VeriCite? 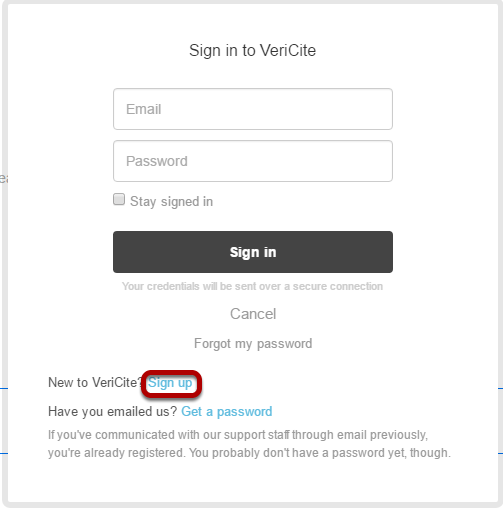 If you need to contact us for support, you can always send an email to support@vericite.com and it will create a ticket in our support portal. 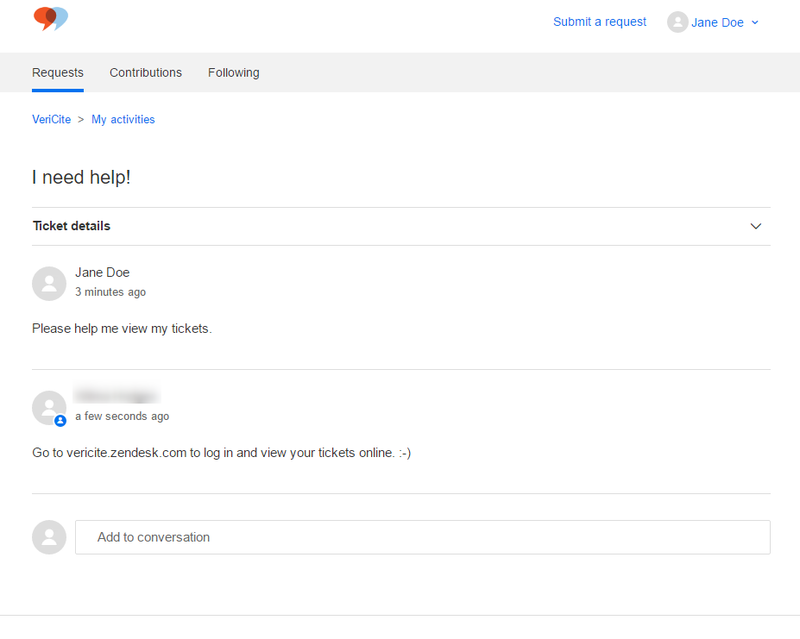 You will receive email updates for each ticket automatically when anyone posts to the ticket. However, if you have any difficulty receiving our support emails due to email filters, or if you would like to view and manage your support tickets online through our Help Center, this article describes how to log in and view your tickets there. Note: VeriCite provides Tier 2 support only. This means that we provide support for your institution's help desk and/or IT staff. We do not provide direct support to students and faculty. If you are a student or faculty member with a question or issue, you should reach out to your local support contacts on campus. If the issue cannot be resolved locally, then your support staff escalate the issue to our Tier 2 support portal. For new clients, click Sign up. 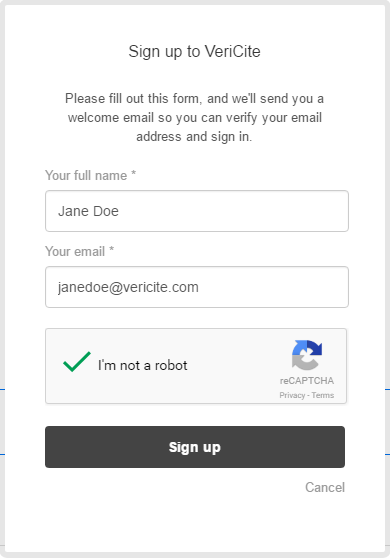 If you are a brand new client and have never submitted a ticket to us via email, click the Sign up link to create a new support portal account. For existing email users, click Get a password. 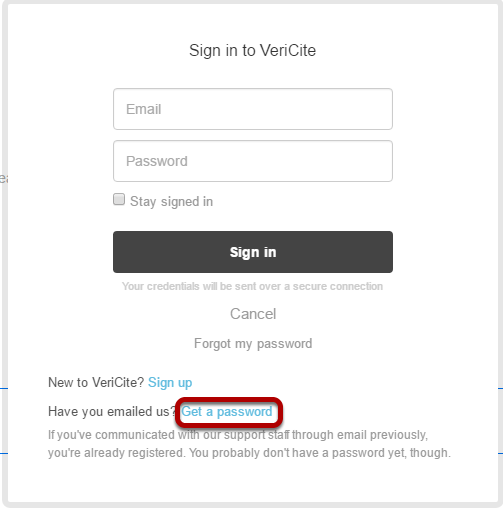 Be sure to use the same email address that you used when you submitted tickets via email to support@vericite.com. 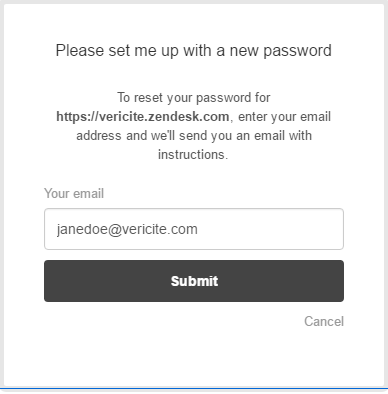 Enter your email address to have a password reset link sent to your email account. Once you are signed in, click on your name and select My Activities. Zoom: Once you are signed in, click on your name and select My Activities. Zoom: Your tickets will display. To submit a new ticket, click on Submit a request at the top of the screen. You can view all of your tickets and check on their status under My Requests. You can also click on the Requests I'm CC's on link to view tickets that you have been copied on. If you are looking for a particular ticket, you may also use the Search box to enter in a keyword. Or, you may use the Status drop down menu to filter by ticket status. Click on the Subject of a ticket to view all details for that item. 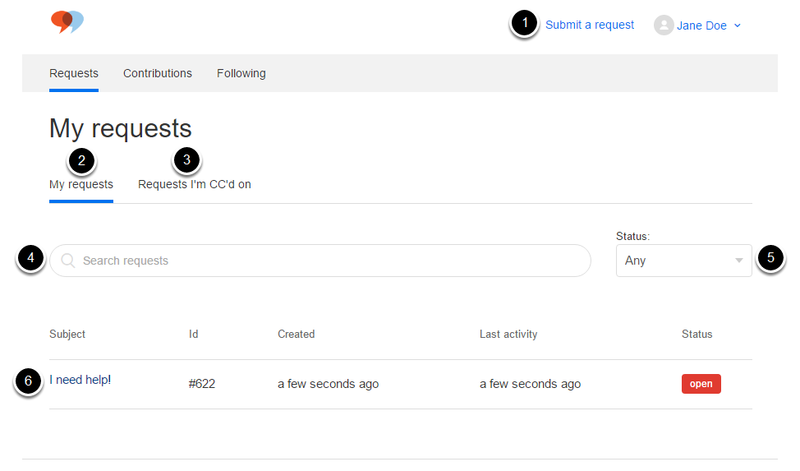 Ticket details will display when a request is selected. Zoom: Ticket details will display when a request is selected.